MANILA, Philippines - U.S. 7th Fleet flagship USS Blue Ridge (LCC 19) arrived in Manila for a port visit March 18, strengthening ties between the U.S. and Philippine navies. While in port, Blue Ridge crew members and embarked 7th Fleet staff personnel will continue to enjoy an historic relationship with their Filipino counterparts through military-to-military exchanges, guided ship tours, receptions and athletic events. Many Blue Ridge Sailors will have the opportunity to reconnect to their shared heritage with the Philippines by visiting relatives and interacting with the Republic of Philippine Navy (RPN). "The long-standing alliance between the U.S. and the Philippines has contributed to peace, stability, and prosperity in the Asia-Pacific region for more than 60 years," said Lt. Cmdr. Wilfredo Eslao, the ship's administration officer, who was born and raised in the Philippines. "We're tied together in more ways than one, and I'm proud to be a link between these two great nations." Sailors and embarked Marines from Fleet Anti-terrorism Security Team Pacific will have opportunities to experience the country's rich culture and history through tours coordinated by Morale, Welfare and Recreation. Additionally, Sailors will compete with RPN sailors in friendly games of basketball and soccer. "Sports are the perfect way to interact with people from other cultures," said Culinary Specialist 1st Class Robert Smith, Blue Ridge sports coordinator. "Even if no one talks to one another, after spending time sweating it out on the field or court, you still feel like you really know each other." 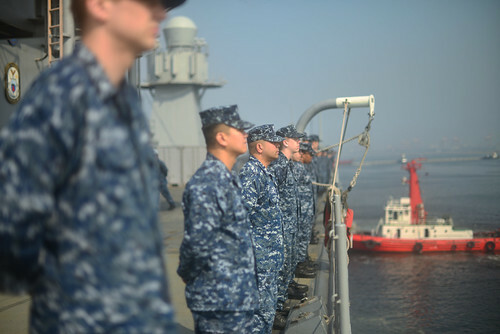 Blue Ridge has been forward deployed to Yokosuka, Japan for 34 years. As the flag ship for Commander, U.S. 7th Fleet, Vice Adm. Robert L. Thomas, Blue Ridge is vital in maintaining partnerships in the 7th Fleet area of operations.